...was the word. Technofreak, like all creative projects started with an idea; in fact, it started with the title. I saw the word on a rave poster in Leicester at some point in the dim, distant past, and thought it would make a good name for a comic book character. So, doodling began in several sketchbooks. At one point, there were going to be a whole super-team of Technofreaks; aliens from another dimension. I remember discussing these ideas with old chum and now writing partner, Barry May, but they never really came to anything. Later, around 1999/2000 the character who was to eventually become Jon Sherlok began to develop in my sketchbooks. I've always had a fascination with sci-fi, and the new Technofreak had a computer implanted in his head. More discussions with Barry probably ensued, and Jon became a drunken private eye. He has an amazing link to all forms of technology and access to anything at all that is on the internet. There were other tech-heads, but the fad for having computer technology implanted into human beings died out very quickly, as the recipients went noisily insane, and their brains fried. At some point, I wrote a three part mini-series about the character, which I fully intended to illustrate myself. A friend, Matt Brown was terrifically supportive, and even offered to pay me and colourist, Yel Zamor to create the artwork. Despite this amazing support, I only ever managed to draw six pages and a cover for this. Several years later, I decided to try again, but this time I'd be less ambitious about how much I could get done. I discussed, and co-wrote a single issue of Technofreak, with a complete story in only twenty-six pages. Barry's input was terrific. I've always loved bouncing ideas around with him, and he has a great ear for dialogue and a strong sense of the importance of character. By the time this new script was complete, I'd started lecturing part-time on 'Cartoon and Comic Arts,' a degree course in comic art at Staffordshire University. It was there that I met Tom Newell, now artist on Technofreak, and, I feel, a co-creator, as he streamlined Technofreak's look and brought in some amazing futuristic design touches. 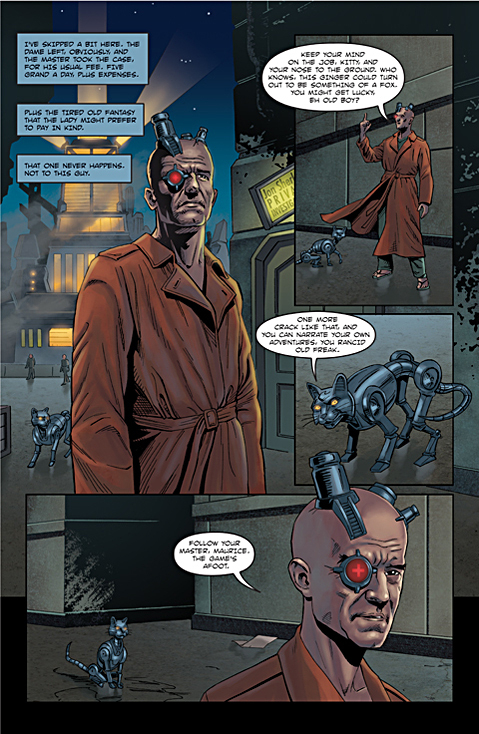 Technofreak was originally conceived as a 30's private eye type of story, but set in the future, with a huge nod to Blade Runner, of course. It was also a comedy, and Tom's art was perfect for it. And Tom is fast too. He drew the comic for a Uni project, in black and white, but we always had the colour version in mind. I coloured the comic at astonishing speed for me, such was my enthusiasm. Niki Foxrobot came on board as letterer, and has done a terrific job. Conan McPhee, another C&CA student was dragooned in to make a short video to support the project. Conan is a real go-getter, always on the lookout for professional opportunities, and he's patient and thorough. His work on the video is terrific. Almost miraculously, via friend, Rachel Humphreys, actor Pascal Gerrard did us an amazing turn as the voice of Maurice, Technofreak's robot cat, who narrates his adventures, and the video/ trailer. Great friend and ex-bandmate in Petrolhead/Swell, Mark Garner very kindly created some bespoke music for the vid, which synced with Pascal's voice-over perfectly. Emma Facey, our IT expert helped immensely in building the website and giving sound advice on everything from volume levels on the soundtrack for the video to Data Protection regulations. My thanks to all of these people, without whom I'd never have got this far. End of historical blog post. Reluctant Editor-in-Chief, Sunday Lunch Comics.